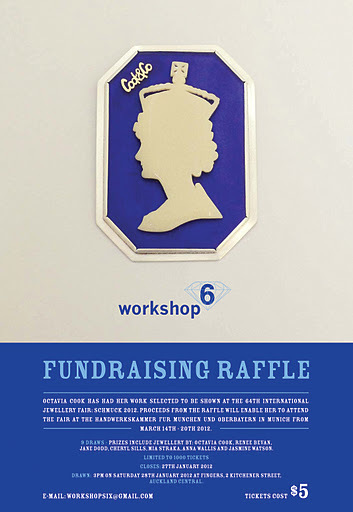 Please find attached a poster for the jewellery raffle that Workshop 6 is kindly holding for me to help me get to Munich next year for the international jewellery fair ‘Schmuck’. I’ve had four pieces of work selected to be shown there and would love to attend this auspicious event! There are nine prize draws of jewellery by myself and the generous ladies of Workshop 6; Jane Dodd, Cheryl Sills, Mia Straka, Anna Wallis and Jasmine Watson. Also kindly donated is a beautiful jewel by Renee Bevan. First prize is my brooch featured on the poster: ‘Her Majesty c.1948’, edition 2/5 and the second prize is the cameo brooch or ring of your choice from my ‘classic’ collection. I will provide photos of the other prize jewels next week to tempt you…. I would be most grateful for any support or if you know of anyone else who might be interested, please pass it on. The prizes will be drawn on January 28th 2012. If you would like to purchase a ticket from the comfort of your home I can provide bank account details and email you a scan of your ticket. This entry was posted in Octavia cook on December 17, 2011 by kristindagostino.